When a tree becomes too densely covered and begins to block out light the J E Varley team can carrying out crown thinning, this is the process of removing branches from the internal structure (crown) of the tree, this usually allows more light to penetrate through and can open a living space or commercial property to more light. For over twenty years we have been carrying out crown thinning and helping people enjoy more light whilst maintaining a healthy tree and environment. 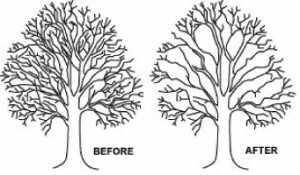 Experts in crown thinning in Yorkshire we work with both residential and commercial businesses everyday to manage their tree populations. If you need crown thinning services in Yorkshire then speak to the J E Varley team, they’ll be able to help with advice and good practical consultation. Call or complete the contact form today.